I love getting the mail in December, because there's always a chance that there will be a Christmas card. I love Christmas cards! Photo cards with Christmas letters are my favorites, because I love catching up with friends and family ("Look how much those kids have grown! She looks just like her mom. Oh, I didn't know he had a new job!") Traditional cards are my other favorites, because I love how they're such an instant shot of Christmas cheer. We always like to display our cards somewhere, and this year they have ended up around the clock in the living room. The collection has grown a bit since I took this photo a few days ago, and I'm hoping for even more. Does anyone offer a class on how to take better bloggy photos? I mean, really! Although I've always tried to send Christmas cards, even as a single college student, we have definitely kicked things up a bit since the arrival of Espen. 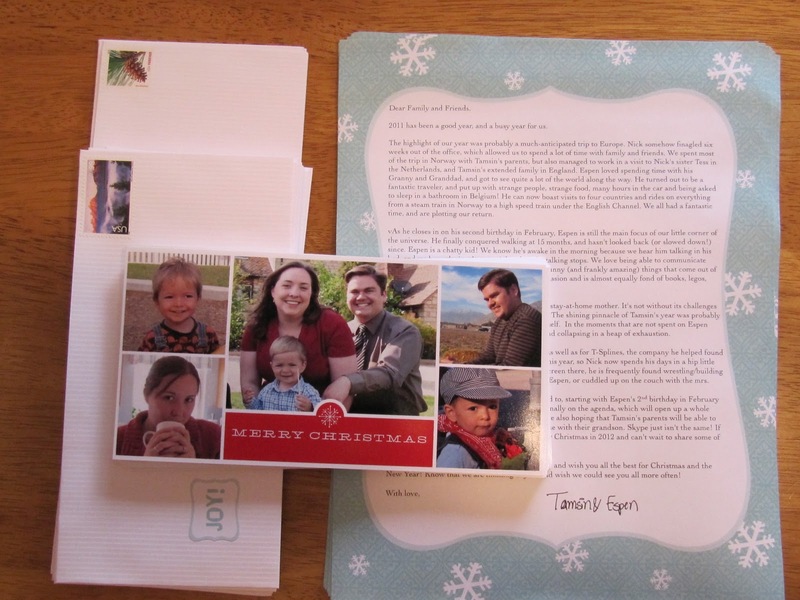 Our family and friends span a couple of continents, and so a photo card and a Christmas letter seem like a good way to go. Below is a little sneak preview of our card and letter. Don't look too closely if you suspect you are on our list! Also, don't worry; Nick is still part of our family, he just hasn't signed the letters yet when I took this photo! I love thinking of our cards and letters winging their little way across the globe, and finally finding their way into a loved one's hands. It reminds me of this quote by Phyllis Theroux: "To send a letter is a good way to go somewhere without moving anything but your heart." So if you get a card from us, know that that is our intention! And if you'd like a card from us, email me your address, and I'd love to send you one. How about you? Do you send Christmas cards? Do you love getting them, or do you find them a bit of a waste of time and resources in this day and age when you could just as easily send an email? Christmas Cards are a lost art ... I LOVE THEM! !I haven't gotten ambitious enough to do a letter yet, but most of our folks all live stateside ... and even more Utah-side, so we probably don't have as much catching up to do as say, someone half-way around the world. That will at least be what I tell myself to give me a good reason for not doing one :)! Real mail is always, ALWAYS better. I don't send one yet because...well, I'm lazy sometimes and it feels like a more experienced family thing to do (though obviously not true). I would also love to receive one if you don't mind sending one more. I'll email my address! Can't wait! We don't send Christmas cards (I'm 28, been married 2 years), but I have a feeling we will once we have kids. Funny--we hardly got any this year. I was wondering if the number of people sending cards was declining too.